Government Tribal confederacy with election for the chief. 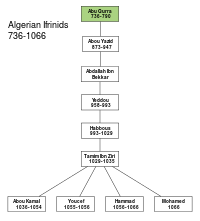 The Ifranids, also called Banu Ifran, Ifran, or the children of the Ifran (Arabic: بنو يفرن‎‎, Banu Yifran), were a Zenata Berber tribe prominent in the history of pre-Islamic and early Islamic North Africa. The Banu Ifran resisted or revolted against the foreign occupiers—Romans, Vandals, and Byzantines—of their territory in Africa. In the seventh century, they sided with Kahina in her resistance against the Muslim Umayyad invaders. In the eighth century they mobilized around the dogma of sufri in revolting against the Arab Umayyads and Abbasids. In the 10th century they founded a dynasty opposed to the Fatimids, the Zirids, the Umayyads, the Hammadids and the Maghraoua. The Banu Ifran were defeated by the Almoravids and the invading Arabs (the Banu Hilal and the Banu Sulaym) to the end of the 11th century. The Ifranid dynasty  was recognized as the only dynasty that has defended the indigenous people of the Maghreb, by the Romans referred to as the Africani. In 11th century Iberia, the Ifrenid founded a Taifa of Ronda since 1039 at Ronda in Andalusia and governed from Cordoba for several centuries. The Banu Ifran were one of the four major tribes of the Zenata or Gaetulia  confederation, and were known as expert cavalrymen. According to Ibn Khaldoun, "Ifrinides" or "Ait Ifren" were successfully resisting Romans, Vandals and Byzantines who sought to occupy North Africa before the arrival of the Muslim armies. According to Corippus in his Iohannis, during the reign of Justinian I between 547 and 550, the Banu Ifran challenged the Byzantine armies under John Troglita to war. Their chief Abu Qurra rebuilt the city of Tlemcen in Algeria in 765 (formerly, it was a Roman city named Pomaria). They opposed the Egyptian Fatimid Caliphate, aligning themselves with the Maghrawa tribe and the Umayyad Caliphate of Córdoba, although they themselves became Kharijites. Led by Abu Yazid, they surged east and attacked Kairouan in 945. Another leader, Ya'la ibn Muhammad captured Oran and constructed a new capital, Ifgan, near Mascara. Under the leadership of their able general Jawhar, who killed Ya'la in battle in 954, the Fatimids struck back and destroyed Ifgan, and for some time afterward the Banu Ifran reverted to being scattered nomads in perpetual competition with their Sanhaja neighbours. Some settled in regions of Spain, such as Málaga. Others, led by Hammama, managed to gain control of the Moroccan province of Tadla. Later, led by Abu al-Kamāl, they established a new capital at Salé on the Atlantic coast, though this brought them into conflict with the Barghawata tribes on the seaboard. During the 11th century, the Banu Ifran contested with the Maghrawa tribe for the control of Morocco after the fall of the Idrisid dynasty. Ya'la's son Yaddū took Fes by surprise in January 993 and held it for some months until the Maghrawa ruler Ziri ibn Atiyya returned from Spain and reconquered the region. In May or June 1033, Fes was recaptured by Ya'la's grandson Tamīm. Fanatically devoted to religion, he began a persecution of the Jews, and is said to have killed 6000 of their men while confiscating their wealth and women, but Ibn Khaldoun says only persecution without killing. Sometime in the period 1038-1040 the Maghrawa tribe retook Fes, forcing Tamīm to flee to Salé. 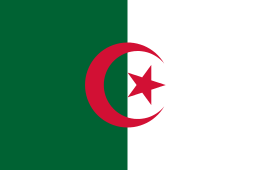 Soon after that time, the Almoravids began their rise to power and effectively conquered both the Banu Ifran and their brother-rivals the Maghrawa. Ifran is a plural for Afar, Efri or Ifri; it is probably derived from the last of these, which means "cave" in Berber. Other possibilities are that their name is derived from one of the major gods of the pagan Berbers, Ifrou, or that the name is derived from the region of Yifran in present-day north-west Libya where they may have originated. The name of the Ifran tribe has many alternative spellings, such as Ifuraces or Afar in Latin, or Ifrinidi, Iforen, Fren, Wafren, Yefren, Yafren, or Yafran, but all of the names mean simply "The Sons of Ifri". The banu- was added by the Arab writers, who called them "ben ifren" or "Ifrinid". Among the Ifran, animism was the principal spiritual philosophy. Ifri was also the name of a Berber deity, and their name may have an origin in their beliefs. Ifru rites symbolized in caves were held to gain favor or protection for merchants and traders. The myth of this protection is befittingly depicted on Roman coins. Ifru was regarded as a sun goddess, cave goddess and protector of the home. Ifru or Ifran was regarded as a Berber version of Vesta. Dehia, usually referred to as The Kahina was the Dejrawa Berber queen, prophetess, and leader of the non-Muslim response to the advancing Arab armies. Some historians claim Kahina was Christian, or a follower of the Judaic faith, though few of the Ifran were Christians, even after more than half a millennium of Christianity among the urban populations and the more sedentary tribes. Ibn Khaldun simply states that Ifran were Berbers, and says nothing of their religion before the advent of Islam. The Banu Ifran were opposed to the Sunnis of the Arab armies. They eventually converted, but summoned under the Kharidjite movement within Islam. Ibn Khaldun claimed that the "Zenata people say they are Muslims but they still oppose the Arab army.". After 711, the Berbers were systematically converted to Islam and many became devout members of the faith. The Banu Ifran were influential in Spain in the 11th century AD. The Ifran house of Corra ruled the Andalusian city Ronda in Spain. Yeddas was the military leader of the Berber troops who were at war against the Christian king and El Mehdi. Abu Nour or Nour of the house of Corra became lord of Ronda and then Seville in Andalusia from 1023 to 1039 and from 1039 to 1054. The son of Nour bin Badis Hallal ruled Ronda from 1054 to 1057, and Abu Nacer from 1057 to 1065. ↑ Histoire des BerbУres et des dynasties musulmanes de l'Afrique ... - ʻAbd al-Raḥman b. Muḥammad Ibn Khaldчn - Google Livres. Books.google.dz. Retrieved 2013-06-16. ↑ Compleḿent de l'Encycloped́ie moderne: dictionnaire abreǵe ́ des sciences, des ... - Noel̈ Desverges, Lжon Renier, Edouard Carteron, Firmin Didot (Firm). - Google Livres. Books.google.dz. Retrieved 2013-06-16. ↑ So says the Rawd al-Qirtas. But according to Ibn Khaldun, Yala died assassinated by a member of the Fatimides in 958. ↑ Recueil des notices et mщmoires de la Sociщtщ archщologique, historique, et ... - Google Livres. Books.google.fr. Retrieved 2013-06-16. ↑ Les cultes paяens dans l'Empire romain - Jules Toutain - Google Livres. Books.google.fr. Retrieved 2013-06-16. ↑ Ibn Khaldoun, Histoire des Berbères et des dynasties musulmanes de l'Afrique septentrionale, traduction de William McGuckin de Slane, éd. Paul Geuthner, Paris, 1978, tome 1, pp. 208-209 . Ibn Abi Zar, Rawd al-Qirtas. Annotated Spanish translation: A. Huici Miranda, Rawd el-Qirtas. 2nd edition, Anubar Ediciones, Valencia, 1964. Vol. 1 ISBN 84-7013-007-2. Gisèle Halimi. Title: La Kahina.